Now that I’ve reviewed a fair few of them I thought I’d write about what I think are the best acoustic guitars under 500 dollars. This list will likely change as I review more and more guitars but the 5 guitars below are the best of the best so far and they are all high quality instruments that belie their low price-tags. Each guitar has been chosen for their sound quality, their playability and their build quality. Kicking off the list we have the Art & Lutherie Ami. If you are looking for a smaller sized guitar as a travel guitar, for your kid to learn on or even as an interesting sound for recordings then you might want to check out the Ami. It has a warm tone and actually packed a decent punch for such a small guitar. And coming it at number 4 we have Fender’s Tim Armstrong Hellcat. Named after Tim Armstrong of Rancid fame (amongst other bands). This is a guitar with attitude and straight away I liked it for its looks. But this guitar is more than just looks – it has a nice tone, and it plays smooth. 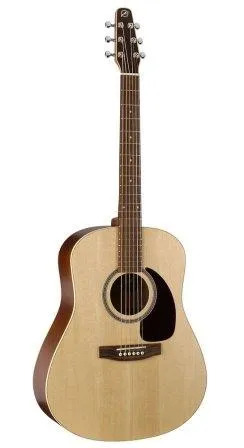 Again this is a smaller guitar – it’s a convert shape so not quite as small as the Ami above but smaller than your stand Grand Auditorium or Dreadnought shape. And whilst it won’t produce the same volume as a full sized dreadnought, this guitar was far from timid. O.k. our first full sized dreadnought on the list. I have a love/hate relationship with this guitar. I wanted so much to hate this guitar. When I first picked it up it reeked of cheap. It had a cheap glossy look and it had cheap tuners and I thought the electric guitar looking neck and headstock looked awful and was trying too hard. But then I started to play it – and much to my horror it played nice and sounded great. For the price this is a really nice guitar – and the fact that it has a bone nut and saddle it is pretty cool. And coming in at #2 is Seagull’s Coastline S6. So if you like this guitar but want a warmer sound or want a smaller size then you’re covered. Overall this guitar just felt like a quality instrument and it’s hard to believe the price-tag when you pick this guitar up and play it. I’ve played guitar’s twice this price that weren’t as nice. 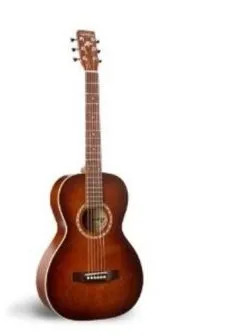 And my pick for the #1 guitar under 500 dollars is the Taylor GS Mini! When I first started playing this guitar I actually couldn’t believe my ears. I had to do a triple take at the price-tag because I wasn’t convinced I had picked up the right guitar. And I also couldn’t believe my ears because of the amount of volume that was coming out of such a small guitar! The GS mini is certainly mini but boy could it project some sound for its size. But it wasn’t just the volume that impressed me about the GS Mini it was the quality of the tone. And in terms of playability it was super smooth to play. The action was actually pretty well set up too – personally I’d still lower it a tad but some would love it just where it is. I love the look of the mahogany top and the ebony bridge and fretboard but much more than that I loved the sound of this little gem and how it played. Thanks for reading and I hope this has helped you to find the best guitar for you. Check out the links under each guitar above to learn more or check out my full detailed reviews of each guitar. If you want to see all of my reviews for guitars costing less than $500 check out the link below. When I bought my first guitar I didn’t spend much money on it as cheap and simple did it for me. Eventually I decided to upgrade and when I did I wasn’t disappointed. 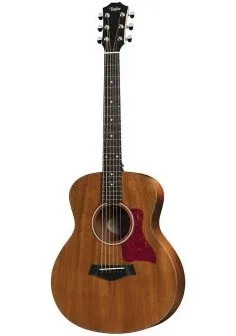 I do quite like the Fender Sonoran myself, as I like to play with a single cutaway on the body, but the Taylor GS is a beautiful looking acoustic guitar I must say. Love the post – looking forward to more like this! Hey Michael – thanks for the input. I do reluctantly like the Sonran too but yeah the Tayor GS Mini is definitely my favourite. It’s just an awesome little guitar that packs a huge punch. If you really dislike small guitars then it’s prob not the one for you but otherwise this is definitely worth trying. The concept of a travel guitar is quite interesting. Iâ€™d never thought about this, however, it does make a great deal of sense. Just like other travel items, a smaller guitar would certainly be more convenient when traveling. 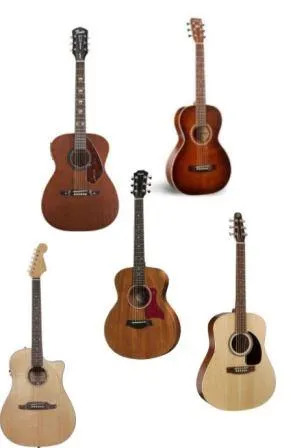 These are top quality acoustic guitars. The Laminate Wild Cherry guitar is especially attractive. These products are produced with great care and precision. I also enjoy the sound and feel of quality acoustic guitars. This is a very pleasant article to read. Thanks for your time and attention to detail. Yeah travel guitars are pretty handy – and they make some pretty high quality ones these days too. The GS Mini is the perfect example of that. Wow… I haven’t played at playing a guitar for many years. Used to play with friends at coffee houses back in the late 60s early 70s. A couple of those friends went on to be musicians and teachers. The way you described the sound and action and the look of the beauties you picked, took me back to those smoky Friday and Saturday nights playing and singing, having a great time. Please let me know when you do an update. I am ready to buy my first guitar in 40+ years. Thanks for your message. Glad to bring back some good memories. Definitely able to get some really good quality guitars for under 500 these days. Manufacturing efficiencies have made that possible – so if you’re not looking to spend too much for your new guitar you don’t have to.